1st time parent, grandparent, foster, or adpotive parent, or have you had a baby in the past 12 mos? You qualify to shop early! Teacher, Military family, or 1st Responder? You qualify to shop early! Want to shop early but don't qualify for the categories listed above? We offer Prime Time Shopping for a $10 entry fee. Tickets are available on our Event Details page under "Get Tickets." 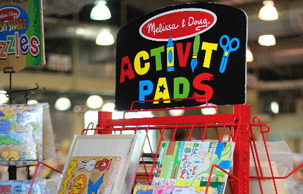 Would you like to showcase your business to hundreds of local families in NEPA? Sign up to be a vendor at our next sale! Spots are limited and filling quickly. Email HeatherO@jbfsale.com for more info. We will have big purple JBF shopping bags at the front door for you to use as you shop. You can also bring along a reuseable shopping bag, a laundry basket with a belt tied to it, or a wagon to carry all of your amazing deals! When your bags get too heavy, you can place them in our HOLD Area for safe keeping until you are ready to check out! Parking is plentiful and FREE. understand that while shopping at the event you may be photographed or videographed, and you grant to JBF and its legal representatives and assigns, the irrevocable and unrestricted right to use and publish photographs/videos of you, or in which you may be included, for editorial, trade, advertising, and any other purpose and in any manner and medium; and to alter and composite the same without restriction and without my inspection or approval. You hereby release JBF and its legal representatives and assigns from all claims and liability relating to said photographs/videos. Local families need their budgets to stretch even further now, than ever before. 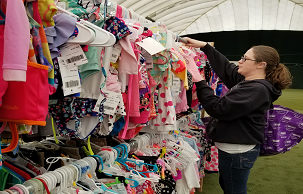 We host twice yearly kids' consignment sales where families can buy the items their growing kids need at 50-90% off retail. 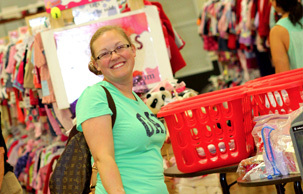 Shopping with JBF will get you much more for your family, for so much less!